Unlike the previous models, The new Oase Aquamax Dry 8000 have been specially introduced for dry mount aplications aimed at gravity fed filter installations that would normally be fitted with a dry mounted pump. The Oase Aquamax Dry 6000 have almost the same frugal running costs as the Oase Aquamax Eco range of pumps and will no doubt be very reliable. The Oase Aquamax Dry 6000 features Asynchronous motors for super quite and efficient operation. The Oase Aquamax Dry 6000 comes complete with 1.5 inch inlet and 1.5 inch outlet, 10 metres cable and a standard 3 year guarantee which can be extended to 5 years. The launched Oase Aquamax Dry 6000 was built on a purpose designed stand with no filter cage or other extras in order to reduce costs. The Oase Aquamax Dry 8000 have almost the same frugal running costs as the Oase Aquamax Eco range of pumps and will no doubt be very reliable. The Oase Aquamax Dry 8000 features Asynchronous motors for super quite and efficient operation. The Oase Aquamax Dry 8000 comes complete with 1.5 inch inlet and 1.5 inch outlet, 10 metres cable and a standard 3 year guarantee which can be extended to 5 years. The launched Oase Aquamax Dry 8000 was built on a purpose designed stand with no filter cage or other extras in order to reduce costs. The Oase Aquamax Dry 16000 have almost the same frugal running costs as the Oase Aquamax Eco range of pumps and will no doubt be very reliable. 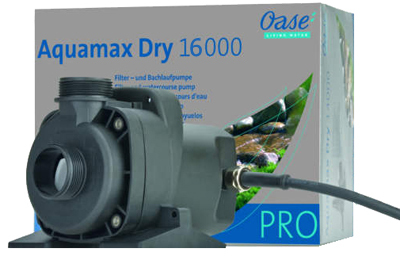 The Oase Aquamax Dry 16000 features Asynchronous motors for super quite and efficient operation. The Oase Aquamax Dry 16000 comes complete with 1.5 inch inlet and 1.5 inch outlet, 10 metres cable and a standard 3 year guarantee which can be extended to 5 years. The launched Oase Aquamax Dry 16000 was built on a purpose designed stand with no filter cage or other extras in order to reduce costs.